It's been really hot in Chicago the past couple of days so I haven't felt like moving. I'm determined not to use my air conditioner for various reasons, so I've just been vegetating in front of the fan, watching TV and sporadically working on a sock (of which none of the yarn has to touch any part of my body). But it's cooled off a little so I've been able to move without breaking a sweat. I've been mostly eating leftovers and popcorn, which I've recently re-discovered and takes very little effort for a big return, but I've finally run out of food. 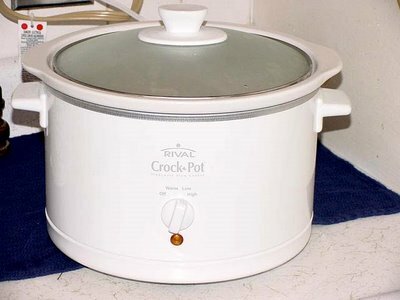 That first little taste of what summer will be like has me determined to master the crock pot. I really like the idea of throwing everything in, plugging it in, turning it on and leaving it alone for a couple of hours. Which is what I've done today. I've taken my newly-acquired formula for BBQ baked beans and thrown it together in the crock pot. I'm teaching a knitting class tonight, so by the time I get home they should be done. Tomorrow I'm going to play with some chicken thighs I got for .39 cents/lb. a couple of weeks ago at Treasure Island.